News TV Channel / The EuroMaidan is a series of protests in Ukraine that began on the night of November 21, 2013, when Ukrainian citizens started spontaneous protests in the capital of Ukraine, Kiev. 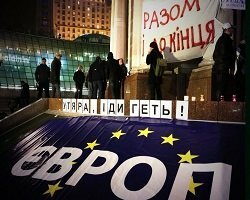 On the previous day, on November 21, 2013, the Ukrainian government suspended preparations for signing an Association Agreement with the European Union. The protest are ongoing with many police present and an increasing number of university students joining the protests.